Wood duck and acorns are like peas and carrots, a perfect, natural combination. Let me explain. 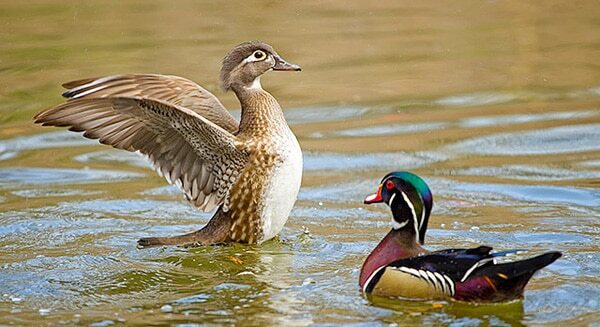 Wood duck, Aix sposa, is one of a very few perching ducks that live in North America. Perching ducks don’t migrate much, and they like to make homes in the holes of trees. The most famous perching duck is a Muscovy, a native of Central and South America that’s been domesticated for a millennia. Well, as you might imagine, a duck living in a tree would make use of the food around it. That’s where acorns come in. While woodies will eat other foods, they love acorns above all else; I’ve seen them with close to two dozen pin oak acorns in their crop before! Acorns add a deep, nutty, slightly tannic element to the meat, and it’s often a little softer than meat from other wild ducks. The birds’ fat also changes dramatically. Wood duck fat tends to be a lot less saturated than that of, say, a rice-fed pintail, so it melts easily and is always sweet. I’ve never had a foul-tasting wood duck. Over the years I’ve experimented with wood duck-acorn dishes, with limited success. I once made a particularly unpleasant pureed wood duck soup with acorns that looked and tasted like poorly made gravy. This dish, however, is a hit. But the dumplings are light like a good Southern drop dumpling, and for once you can really taste the acorn in them — the flavor of acorns can get lost sometimes. A little nutmeg rounds things out. As for the salsa, that’s really the best word I can come up with for this salad… although salad might be a better one. I love crunchy salads, and I wanted to highlight winter vegetables, so there ya go. To make this well, you do need to be able to cut fine dice. If you can’t, I’d suggest shredding everything on a box grater. The salsa will be different, but it will still taste good. A final word on the oil: A nut oil is really what you want to use here, and I use roasted hazelnut or walnut oils. It just fits. Any of the parts of this recipe can be made separately and used in other dishes, and you can make several substitutions for some of the harder-to-find ingredients. If you can't find jerusalem artichokes, use jicama or water chestnuts or a parsnip. If you can't find a good nut oil, just use any nice oil. If you don't have acorn flour (likely), use chestnut flour or a dark grain flour like spelt or dark rye. The salsa can be made several hours ahead of time, and the acorn dumpling batter will hold, tightly covered in plastic wrap, up to a day in the fridge. And obviously you can use any duck for this recipe, or even venison backstrap. To make the acorn dumpling dough, put the milk, duck fat and salt to a simmer in a small pot. Whisk in the acorn and regular flour, turn the heat to low and stir until the dough starts to come off the sides of the pot. Turn off the heat and let the dough cool for about 10 minutes. Stir in the egg and grated nutmeg, then move the dough to a bowl. Cover and let it stand for at least 20 minutes and up to overnight. Take the duck breasts out of the fridge and salt them well. Let them sit on the counter for 30 minutes or so while the dumpling dough rests. While this is happening, Bring a large pot of water to a boil, then salt it so it tastes a little salty -- not as salty as pasta water. Once it boils, reduce the heat to a bare simmer for now. Pat the duck breasts dry with a paper towel. If the duck is fatty, put the 2 teaspoons of duck fat in a large saute pan and turn the heat to medium-high. When it melts, add the duck breasts skin side down. If the duck is not fatty, do the same thing, but let the pan get hot first. Cook the skin side of the duck breasts on medium heat (it should sound like sizzling bacon) until the skin is brown and crispy, about 6 minutes. Turn the breasts over and use the finger test for doneness to determine when they're ready; I like my duck medium-rare. Take them off the heat and let them rest on the cutting board. While the duck breasts are cooking, turn the heat up on the water to a solid simmer, but still not a boil. Shape the acorn dough into dumplings the size of a walnut with wet hands. Gently drop them into the simmering water and let them cook for a minute or two. Use a spoon or something to nudge them off the bottom of the pot, so they can float when they are cooked through. Once the dumplings float, let them cook another minute and them move them to a shallow pan. Gently coat them with a little hazelnut oil. Repeat with the rest of the dough. Once the duck breasts are resting, add the green herbs to the winter salsa. 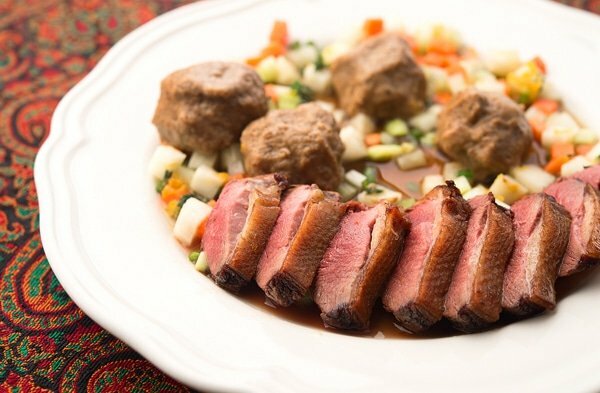 Slice the duck breasts and serve skin side up, with a little drizzle of the hazelnut oil, with the dumplings and salsa on the plate. This looks great Hank! I’m gonna have to try to get my hands on some acorn flour, for sure! Great looking recipe. I went duck hunting for the first time last weekend (thanks in large part to your blog/books). The morning was perfect. In the purple dawn we could see flights coming in from Leech Lake to land in the pothole we had staked-out. I walked back to the truck with two wood ducks and a mallard. I’m going to cook the wood duck breasts tonight. 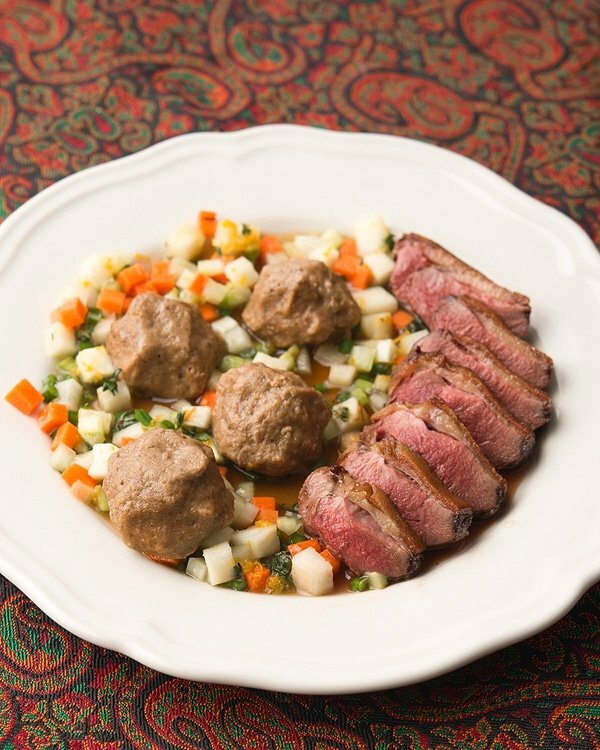 Do you have any other favorite wood duck recipes or methods? I shoot many of them and have yet to find a favorite way to prepare them. They seem a bit too lean and mild for whole roasting.